In 1995, after five years of development, ASCA incorporated Agility competition into its competitive programs. ASCA Agility is open to all breeds. There are three titling classes: Regular, Jumpers, and Gamblers. The three levels offered are Novice, Open, and Elite. In 2014 ASCA added a lower jump height program and the original program was renamed the ‘Championship’ program. It offers three divisions; Standard, Veterans and Junior Handler. An Agility Trial Champion (ATCH) title is a goal these dogs can work toward in all divisions. 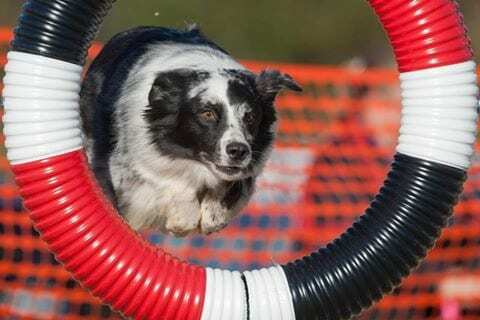 The ACE (Agility Competition Enthusiast) program offers the opportunity for dogs to jump one jump height lower with additional course time, for qualifying scores and titling certificates. In October 2014 the ACE Standard division classes will become mandatory at all ASCA sanctioned trials and in January 2015 the Senior Dog Division for dogs 10 years and older will be added. The supreme award for the ACE program is the ACE (Agility Competitor Extraordinaire) Award. This fun and challenging team work sport offers great competition. Most dogs enjoy the sport of agility. Although it may look easy, it takes a lot of time and training for a dog and handler to become a team. ASCA AGILITY – IT’S FOR ALL-BREEDS!